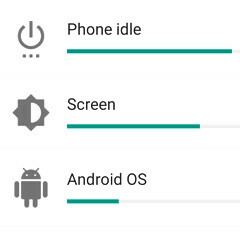 If you have a smartphone or tablet running Android Marshmallow or Android Lollipop, and you're often checking its detailed battery stats, you might want to know that there's a super quick way to access them. Instead of accessing battery stats via the main Settings menu (which requires extra steps, plus some scrolling down), you can just do this: from the home screen, pull down the Quick Settings panel using two fingers, and tap on the battery icon - that's all you need to do to reveal battery stats, including an estimated time until the battery dies (unless you charge it), and exactly what has been using the battery since the last charge. Now, this is not a secret by any means. However, those who are new to Android, or those who aren't usually tinkering with their gadgets may not have discovered this yet. Mind you, we're talking about stock Android devices here. The experience on non-stock devices might be different. Once the Quick Settings panel is revealed, you just have to tap on the battery icon. And there you go - battery stats have been revealed. You can pull down the Quick Settings panel from your home screen by swiping down from the top of the screen with two fingers. How is this even worthy of an article? This is pretty much common sense. Why not do an article for how to turn on the phone next? exactly. never gonna check PA again. FWIW, I always found the two finger scroll down option on my Nexus device to be awkward. You're not missing much. what a joke by PA! OK now can anyone tell me why it doesn't show how long the phone has been off the charger? Did they just decide to leave that out with Marshmallow?